Adipose tissue, or body fat, is loose connective tissue composed mostly of adipocytes. 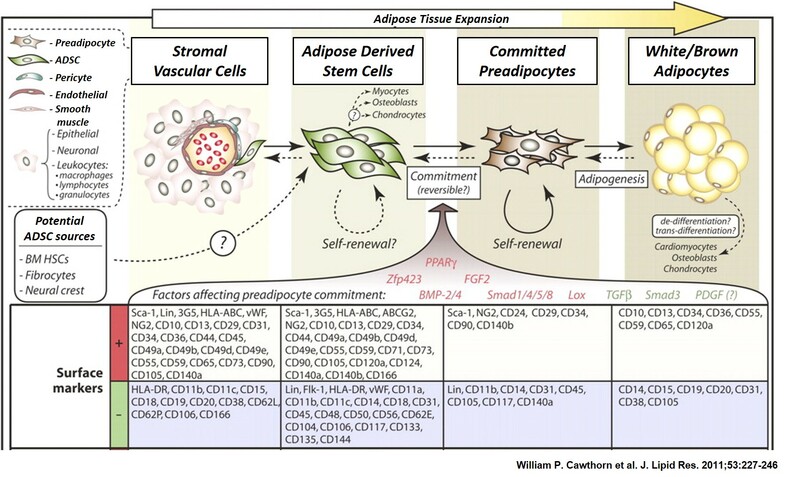 In addition to adipocytes, adipose tissue contains the stromal vascular fraction (SVF) of cells including preadipocytes, fibroblasts, vascular endothelial cells and a variety of immune cells (i.e., adipose tissue macrophages)  (Figure 1). Adipose tissue is derived from preadipocytes. 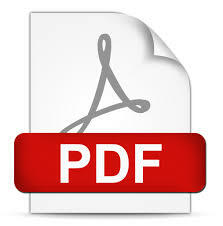 Its main role is to store energy in the form of lipids, although it also cushions and insulates the body. Far from hormonally inert, adipose tissue has, in recent years, been recognized as a major endocrine organ , as it produces hormones such as leptin, estrogen, resistin, and the cytokine TNFα. Moreover, adipose tissue can affect other organ systems of the body and may lead to disease. The two types of adipose tissue are white adipose tissue (WAT), which stores energy, and brown adipose tissue (BAT), which generates body heat. iXCells offers a wide collection of primary cells isolated from human and rotent adipose tissues, including Stromal Vascular Fraction (SVF), Adipose-Derived Stem Cells (ADSCs), Preadipocytes (PAds). These cells are are fully validated by marker staining, flow cytometric analysis and differentiation. They are negative for HIV-1, HBV, HCV, mycoplasma, bacteria, yeast, and fungi. Figure 1. Relationships between SVCs, ADSCs, committed preadipocytes, and mature adipocytes. Stromal Vascular Fraction (SVF) is isolated from adipose tissue (white fat or brown fat), which composed of very crude and heterogeneous mix of multiple cell populations with different degree of maturity and function (Figure 2). Figure 2. CD45, CD31 and CD29/CD34 flow result of mouse SVF (white fat). 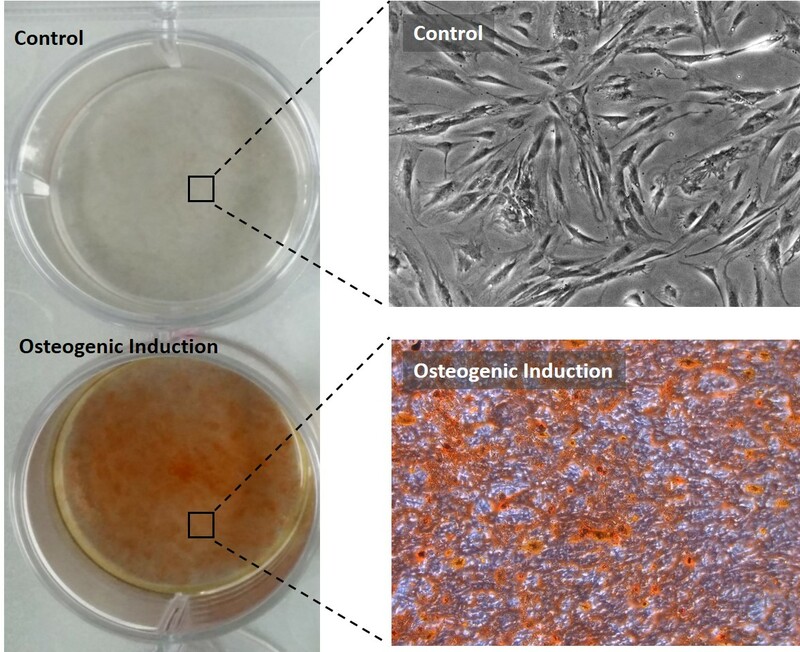 It has been shown that the ADSCs demonstrate very similar phenotypic and functional characteristics to that of bone marrow-derived mesenchymal stem cells. ADSCs are also known as adipose-derived mesenchymal stem cells (AD-MSCs), adipose MSCs (AMSCs), adipose-derived adult stem (ADAS) cells, and adipose stromal/stem cells (ASCs). iXCells ADSCs are positive for CD29, CD44, CD73, CD90, CD105, and negative for CD14, CD31, CD45 (Figure 3). Normal human ADSCs have been reported to differentiate into many different lineage including chondrogenic, adipogenic (Figure 4), osteogenic (Figure 5), and neural lineages. Figure 3. 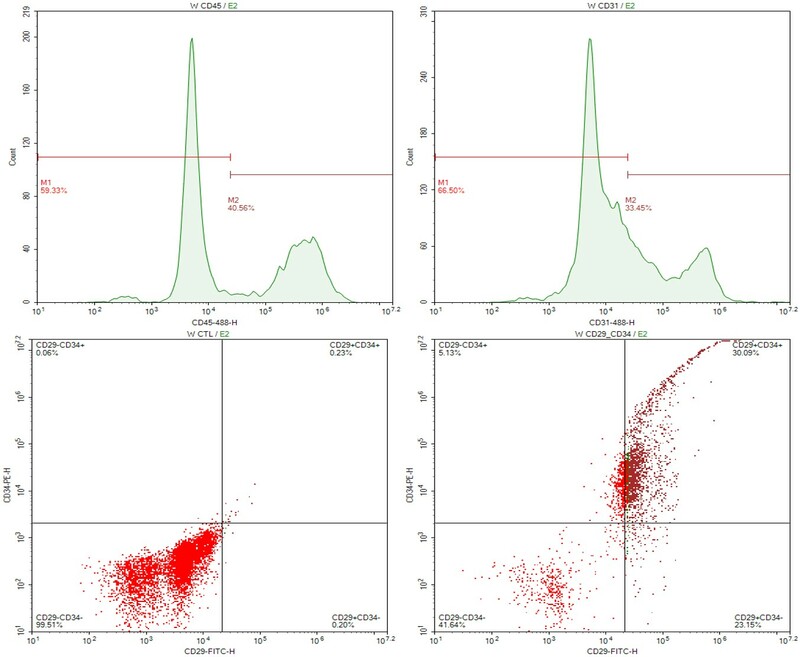 Immunostaining of human ADSCs surface markers. Figure 4. Human ADSC adipocyte differentiation (Day 14). Figure 5. Human ADSC osteogenic induction (Day 24). Kershaw EE, Flier JS; Flier (2004). "Adipose tissue as an endocrine organ". J. Clin. Endocrinol. Metab. 89 (6): 2548–56.